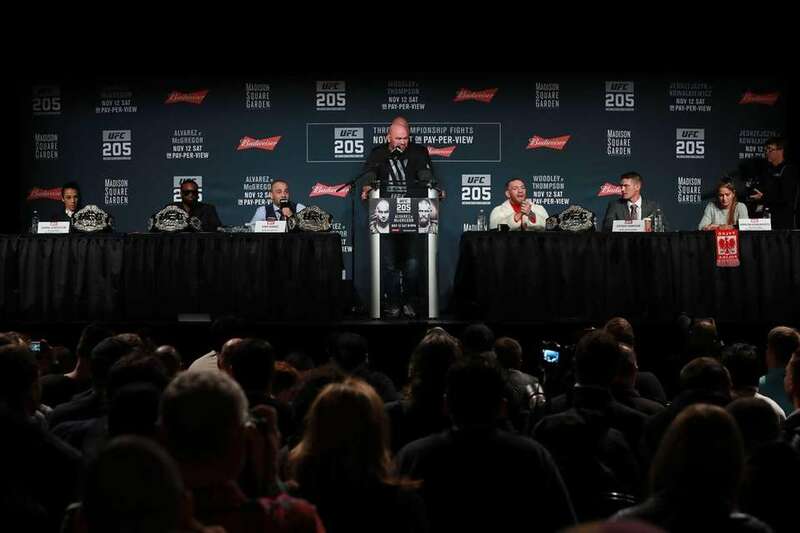 Scenes from the UFC 205 pre-fight press conference on Thursday, Nov. 10, 2016 at The Theater at Madison Square Garden. 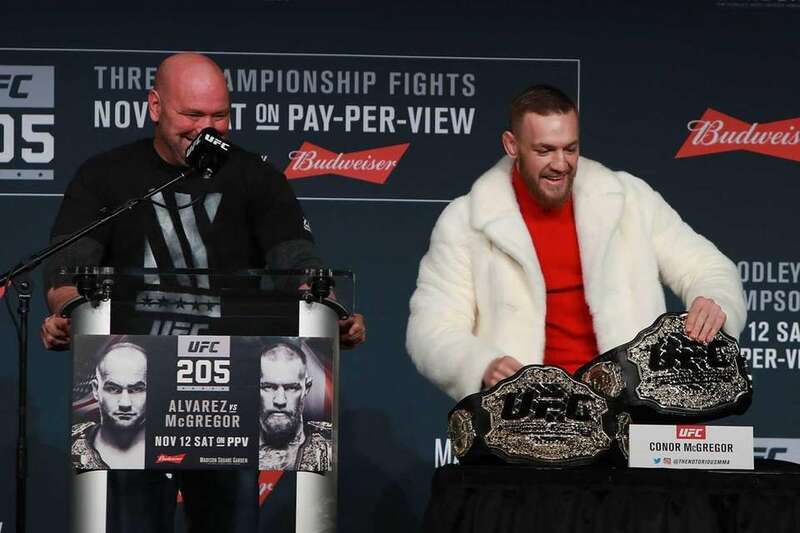 UFC 205 is Saturday, Nov. 12. 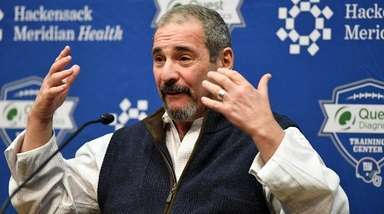 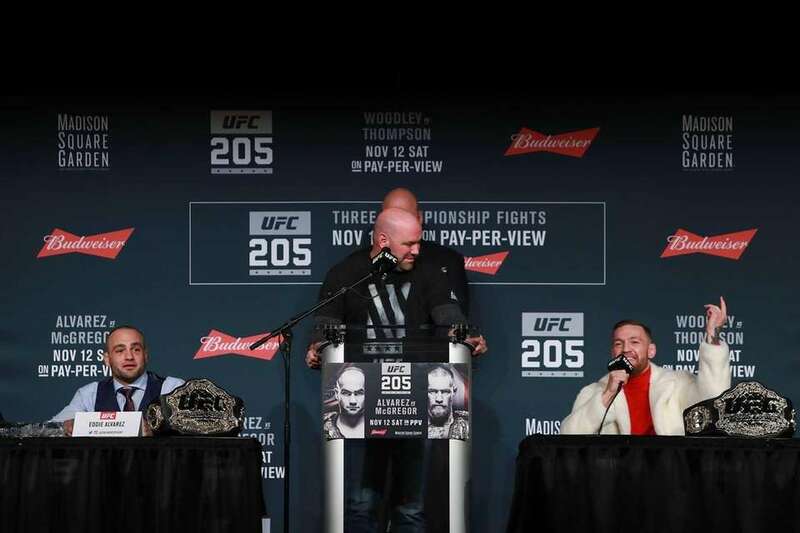 UFC president Dana White answers a question during the UFC 205 press conference at The Theater at Madison Square Garden on Nov. 10, 2016. 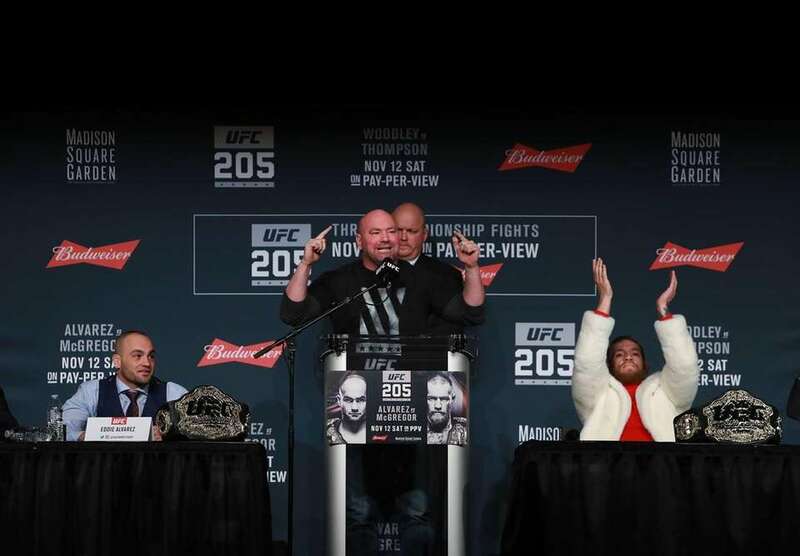 Fighter Eddie Alvarez, left, points to the vacant seat of his opponent Conor McGregor as UFC president Dana White, right, looks on during a news conference ahead of UFC 205, Thursday, Nov. 10, 2016, at Madison Square Garden. 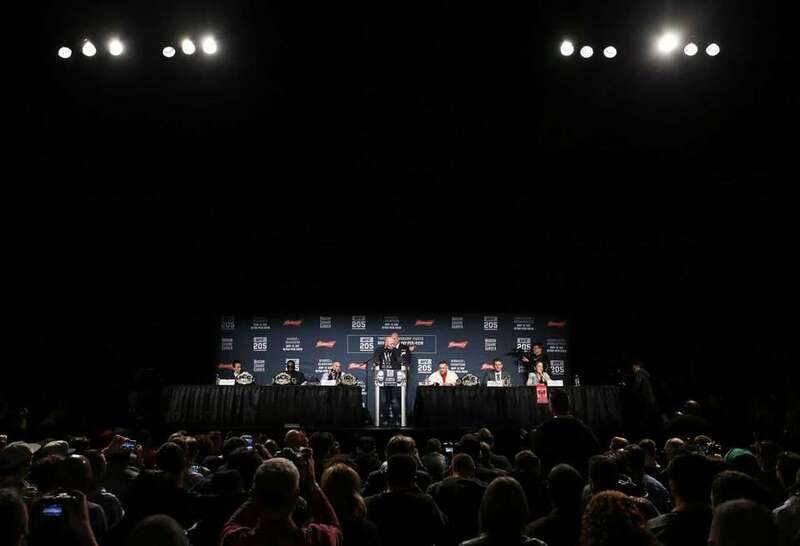 A general view from the UFC 205 press conference at The Theater at Madison Square Garden on Nov. 10, 2016. 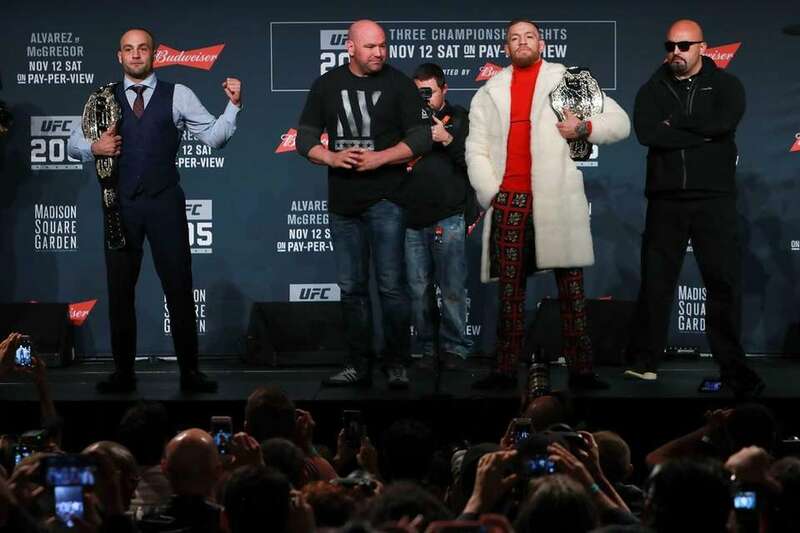 Conor McGregor and Eddie Alvarez answer questions during the UFC 205 press conference at The Theater at Madison Square Garden on Nov. 10, 2016. 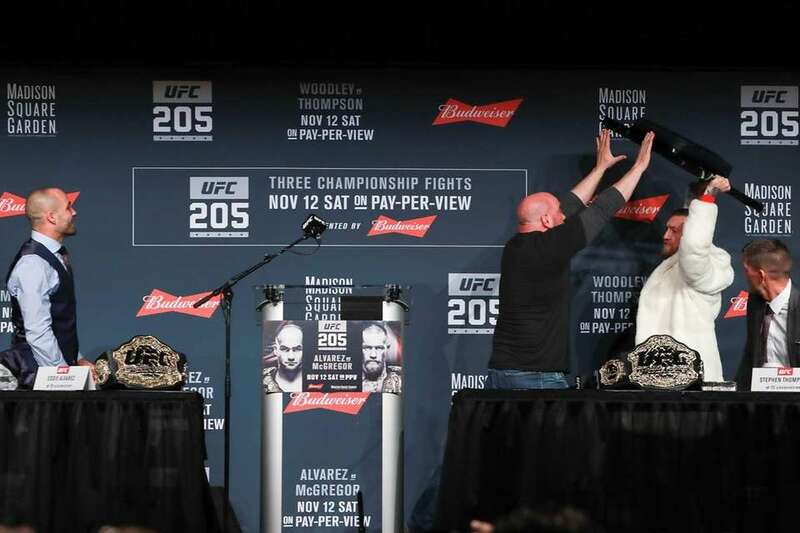 UFC president Dana White thanks the crowd after the UFC 205 press conference at The Theater at Madison Square Garden on Nov. 10, 2016. 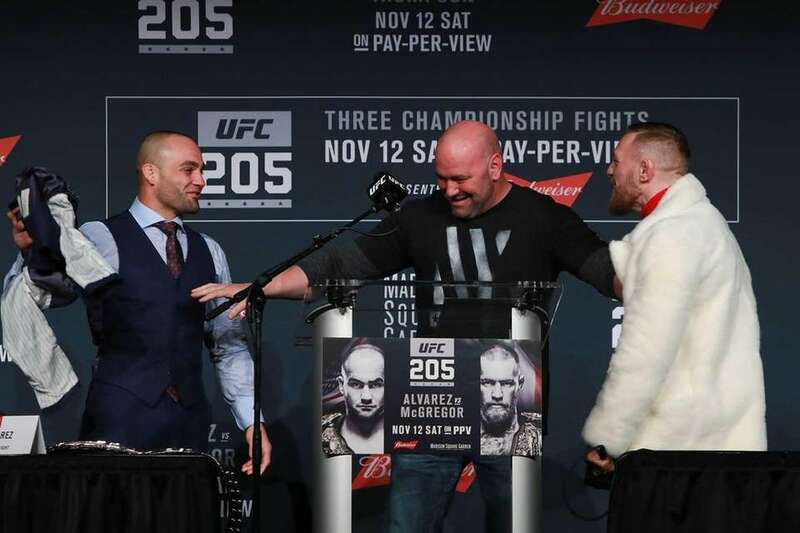 UFC lightweight champion Eddie Alvarez, left, and UFC featherweight champion Conor McGregor of Ireland square up for a photo during the UFC 205 press conference at The Theater at Madison Square Garden on Nov. 10, 2016. 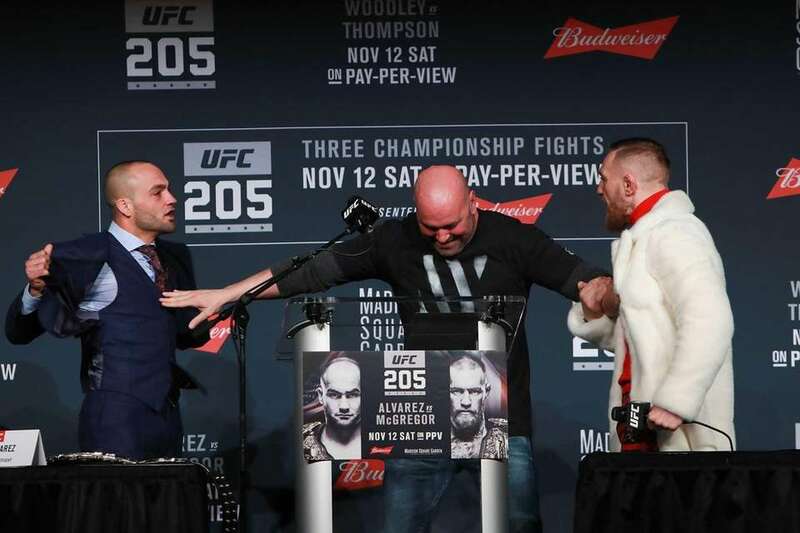 UFC president Dana White separates Conor McGregor and Eddie Alvarez during the UFC 205 press conference at The Theater at Madison Square Garden on Nov. 10, 2016. 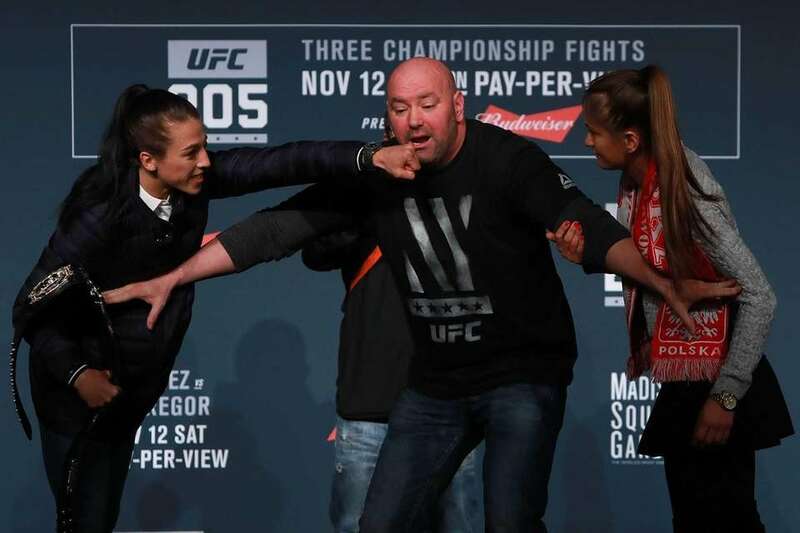 Joanna Jedrzejczyk and Karolina Kowalkiewicz square up for a photo during the UFC 205 press conference at The Theater at Madison Square Garden on Nov. 10, 2016. 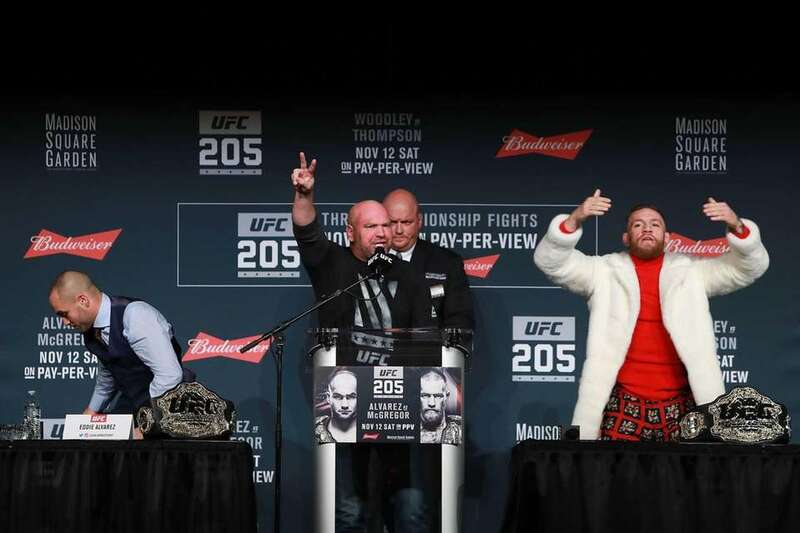 UFC president Dana White separates Joanna Jedrzejczyk and Karolina Kowalkiewicz as they face off during the UFC 205 press conference at The Theater at Madison Square Garden on Nov. 10, 2016. 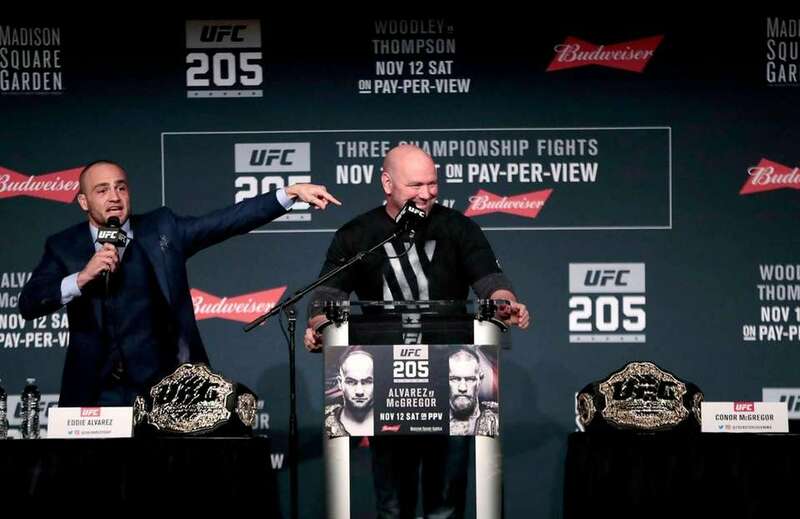 UFC president Dana White stops Conor McGregor from throwing a chair at Eddie Alvarez during the UFC 205 press conference at The Theater at Madison Square Garden on Nov. 10, 2016. 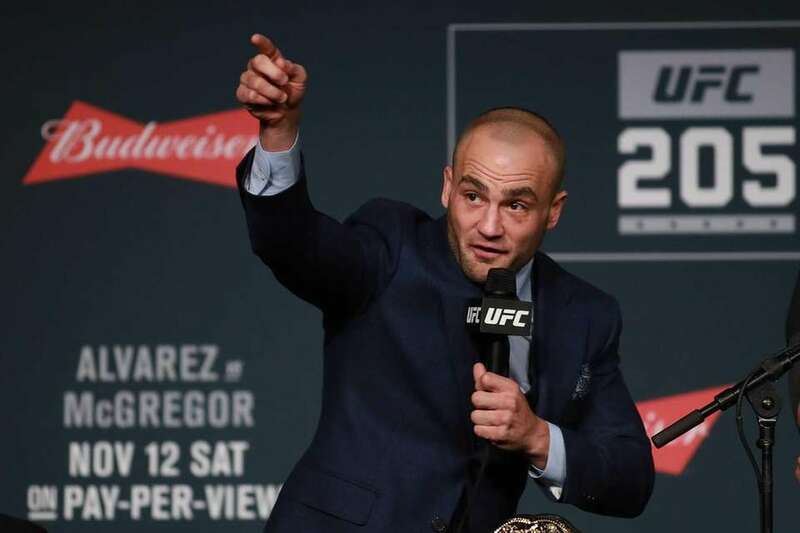 UFC Lightweight Champion Eddie Alvarez motions to the crowd as he asks where Conor McGregor is during the UFC 205 press conference at The Theater at Madison Square Garden on Nov. 10, 2016. 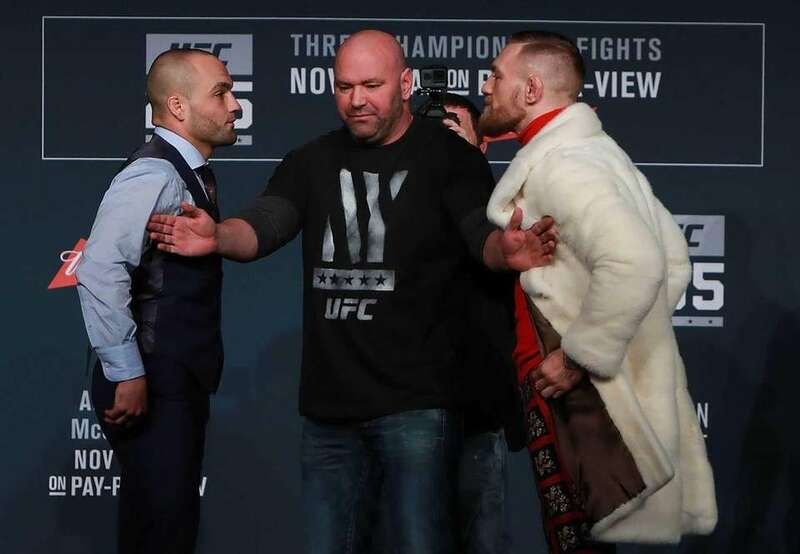 UFC president Dana White separates Eddie Alvarez and Conor McGregor during the UFC 205 press conference at The Theater at Madison Square Garden on Nov. 10, 2016. 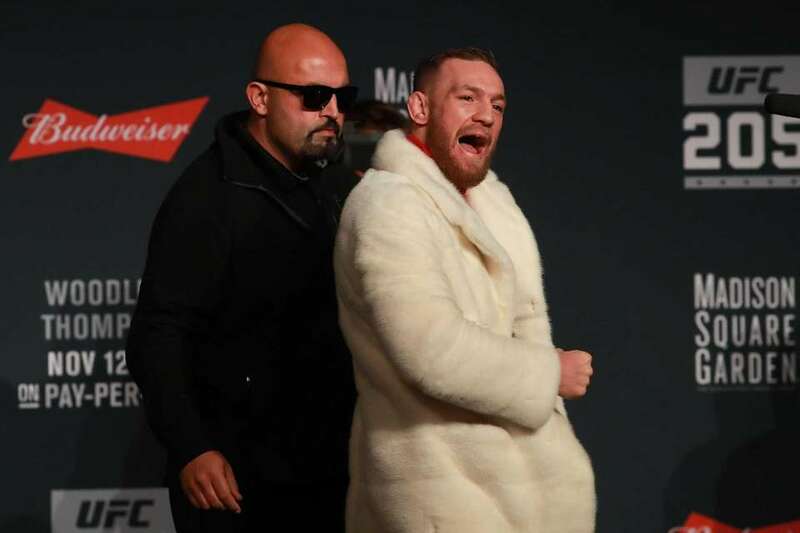 UFC Featherweight Champion Conor McGregor reacts as he leaves the stage after the UFC 205 press conference at The Theater at Madison Square Garden on Nov. 10, 2016. 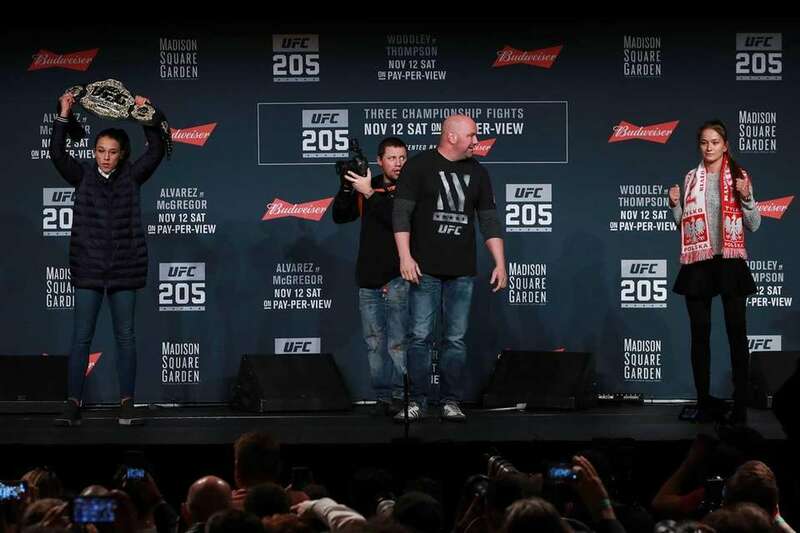 Conor McGregor of Ireland takes Eddie Alvarez's lightweight belt during the UFC 205 press conference at The Theater at Madison Square Garden on Nov. 10, 2016. 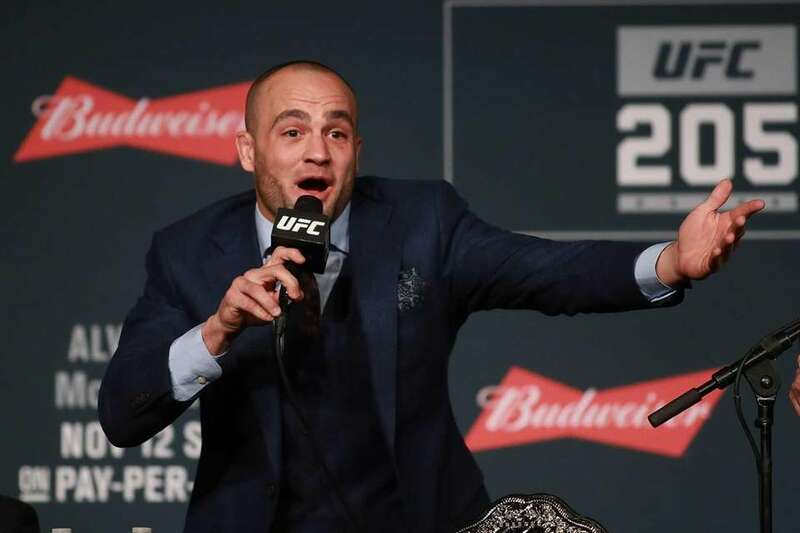 Lightweight Champion Eddie Alvarez motions to the crowd as he asks where Conor McGregor is during the UFC 205 press conference at The Theater at Madison Square Garden on Nov. 10, 2016. 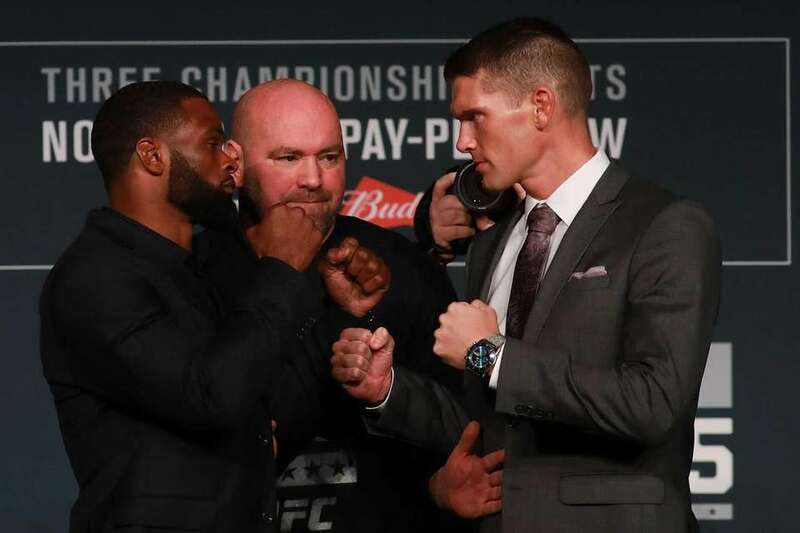 UFC Welterweight Champion Tyron Woodley and Stephen Thompson face off for a photo during the UFC 205 press conference at The Theater at Madison Square Garden on Nov. 10, 2016. 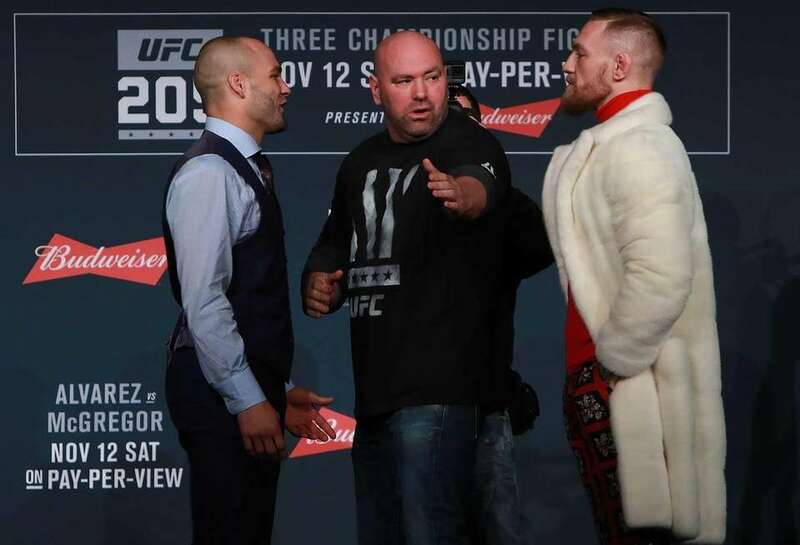 Joanna Jedrzejczyk and Karolina Kowalkiewicz face off during the UFC 205 press conference at The Theater at Madison Square Garden on Nov. 10, 2016. 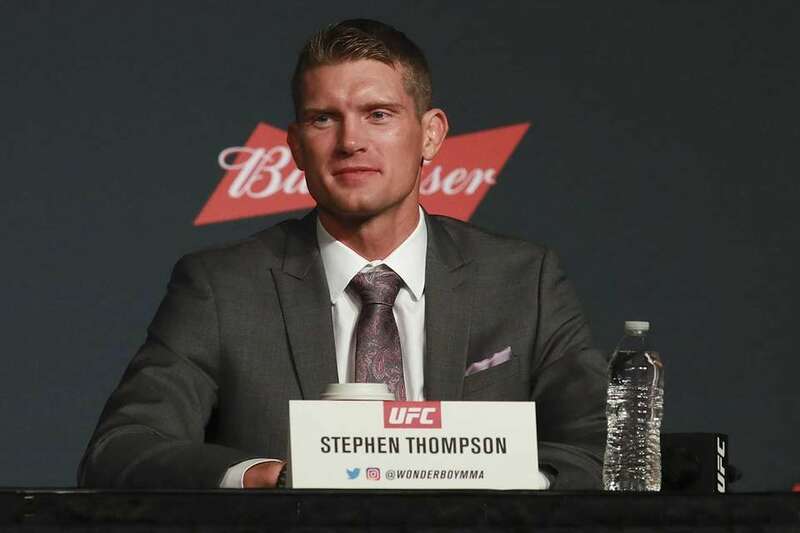 Stephen Thompson answers a question during the UFC 205 press conference at The Theater at Madison Square Garden on Nov. 10, 2016. 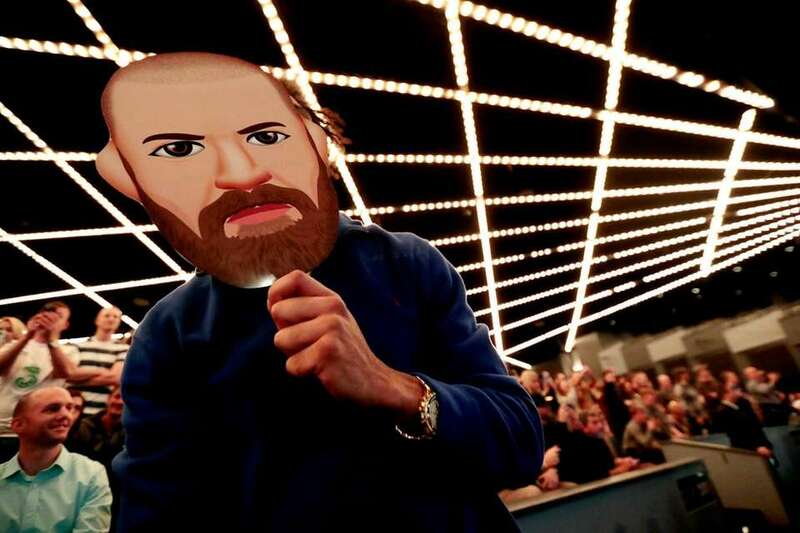 A supporter of fighter Conor McGregor holds up a sign with the likeness of the fighter during a news conference ahead of UFC 205, Thursday, Nov. 10, 2016, at Madison Square Garden. 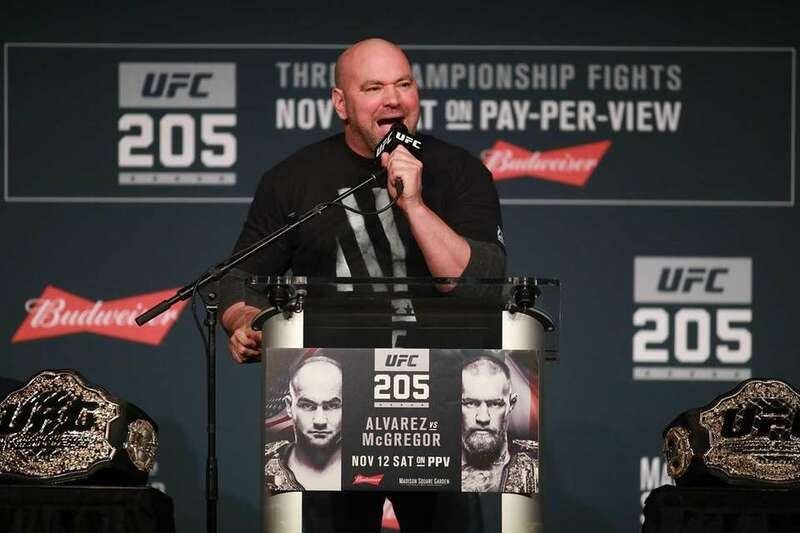 UFC 205 in NYC: Pick the winnersUFC 205 is the promotion's first fight card in New York City. 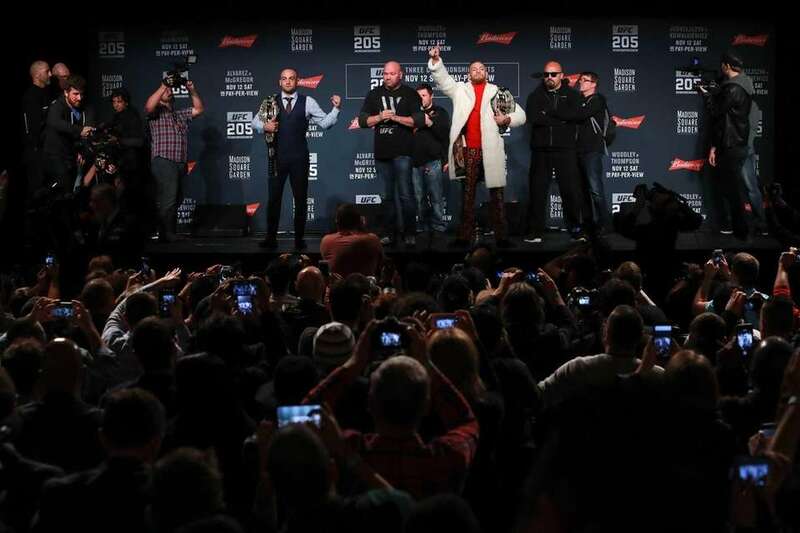 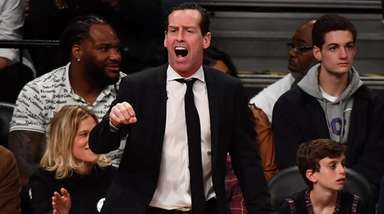 With three title UFC 205 fight weekScenes from UFC 205 fight week leading up to the first professional MMA bouts in ... UFC 205 in NYC: Meet the fightersUFC makes its Big Apple debut Nov. 12 at MSG.